The 14th Annual Canadian Jackalope Open is next Friday on August 3rd at the Khao Kheow Country Club with a Stableford format and shotgun start at 12 noon. This charity tournament is our major fund-raiser for the Camillian kids living with HIV and disabilities. If you would like to sign up for this event, please contact them ASAP at [email protected] For more information, please see registration form in the Sports Section of this issue. 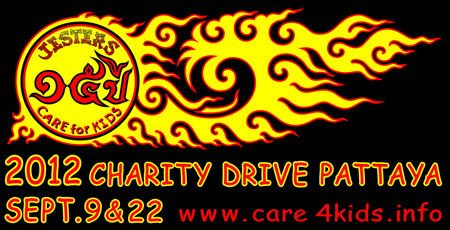 Since 2008, the Canadian Jackalope Open has been a Diamond Sponsor, or 400,000 baht donor, for the Jesters Care for Kids Charity Drive. They joined forces with us then and requested that all funds raised from their tournament would go to the kids at the Camillian’s Child Care Center in Rayong and the Camillian Home in Lat Krabang. Given that we were also staunch supporters of the Camillians, we not only whole heartedly agreed to their terms, but also vowed to sweeten the pot from our side too. And, as a result, over the last 4 years, we have collectively provided 2,770,000 baht to the kids at their projects. In 2008, when we asked Father Giovanni where our joint donation might be best utilized, he suggested we cover the 24/7 care-giving, physical therapy and anti-retroviral medication (ARV) for two children living with HIV and disabilities. One of the children is a girl, Fey, who was 4 years old when she came to the Center. She was born HIV-positive and abandoned by her parents after birth in a hospital in Nong Khai. She is blind and mentally impaired, most likely from her untreated HIV infection. Initially, she could not stand or crawl and was prone to frequent emotional outbursts. After starting the administration of ARV’s, in conjunction with physical therapy and loving care, her tantrums started to subside, and she was able to stand and walk with assistance. Today, she is 9 years old, able to walk on her own and her demeanor had is significantly more sunny. The other child, Tewid is a boy, who is 16 years old now. He was also born HIV-positive and due to late administration of ARV’s had become partially paralyzed, and virtually comatose. He is also thought to be autistic. 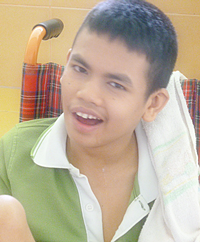 Today, Tewid enjoys listening to music, watching TV and spending time with other resident children. 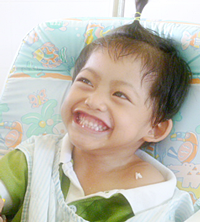 He is often found smiling, recognizes his care givers and, able to sit up on his own. His mother, who is deaf from her own HIV infection, also stays and cares for him at the Center. In late 2008, both of these children were transferred from the Camillian Child Center in Rayong to the Camillian Home in Lat Krabang near Suvarnabhumi Airport, which is where disabled children who have their HIV status stabilized take up residence. Here there are professionally trained specialists who are able to help the kids learn to live with their disabilities. Fah Sai, 4 years old. Faisal Malik is coordinator on site and is assisted by Kannika Tumma, who is in charge of PR and their outreach program. The latter entails making home visits to the disabled in the community. Presently there are 22 resident children at the Home, 14 of those are orphaned and 12 are HIV positive. There are also 30 regular day visitors, who come for basic education and physical therapy. Most of the kids in question are afflicted by physical disabilities, cerebral palsy, blindness, autism, Down’s syndrome and/or learning impairment. There are also 34 dedicated staff members at the center, who together work 8-hour shifts around the clock, every day of the year. 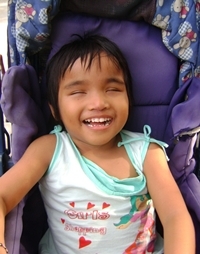 In addition, Fah Sai, the 4-year old abandoned girl with cerebral palsy, who we recently featured in the July 6th edition of the Pattaya Mail, is now the 3rd child under our umbrella at the Camillian Home. Besides the 24/7 care for the above 3 kids, every year, the Canadian Jackalope and Jesters take the 70-plus Camillian kids from the Rayong projects to Big C for Christmas shopping and in the spring on an excursion of their choice. Last April, we went with them to Dream World, a sensational amusement park in Bangkok. If you would like to learn more about these kids, please visit the Camillians’ website at www.camillianhomelatkrabang.org . If you would like to learn more about the Canadian Jackalope, please visit them at http://jackalopeopen.awardspace.com/. And, for us go to www.care4kids.info or www.facebook.com/jesterscare.forkids.